OUR PRICE: $36.47 - Join Rewards Get $3 Dance Dollars On This Item! The perfect competition jazz shoe, the "Pulse" reflects curves of the instep with a glove-like fit and low profile. Moldable suede front sole is perfect for spinning and turning while the new low profile heel gives the dancer optimum control for stopping. Other features include arch hugging neoprene stretch satin arch, soft leather upper, embossed pleat detail to accentuate the arch, and a split-sole design. I've had my jazz shoes for the past 3 and a half years and within the past couple months I have noticed mine getting holes in them mainly on my turning foot. I would highly recommend these jazz shoes because they are very comfortable and hold up very well! They are about 30 dollars, but if you think about it I've had mine for over 3 years so that's about 10ish dollars a year on a pair of jazz shoes. Totally worth it!! These shoes are amazing! They run just a little bit large but are excellent! Very comfortable. They do begin to stink though but nothing baby powder can’t fix. I am a dance instructor and I blow through jazz shoes quickly. These are my favorite because they last a long time and are very comfortable. Bonus they make my foot look pretty. 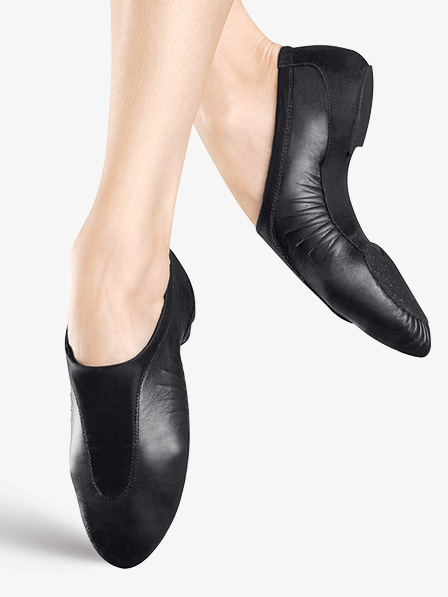 These jazz shoes are very flexible and comfortable. They do run small. My daughter wears a shoe size 3 or 4, her other Bloch jazz shoes (different style) a size 5, and in these a size 6. The local store was very helpful in returning the small shoes and ordering online the correct size with free ship to home. Excellent customer service. 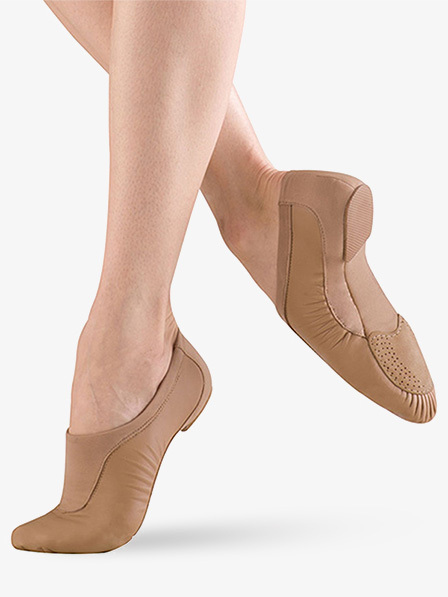 I ordered these bc I love they way they make the dancers foot look. Very nice arch - pointed foot. I ordered a size up for both of my dancers. They have only been wearing them a few weeks, but it seems to be the right size. Street shoe, narrow foot, size 6.5 - ordered a size 7, street shoe, average width, size 7.5 - ordered a size 8. These shoes are great! They are very comfy and durable, but the only reason I said it runs small was because it was just a little bit smaller. But it fit me perfectly with some room when I bought it a size up. Finally I found a trustworthy shoes. But... the tan shoes and the black shoes are completely different sizes. Many people on my team said that the tan and black shoes didn't have the same sizing, being that the tans were way smaller than expected. I hope this help! These shoes feel like socks. I wear a solid 6 in street shoes and ordered a size 6. I find they stretch quite a bit with a bit of wear and I will order a size 5.5 next time. Would definitely recommend.! This shoe was excessive for me. I did not like feeling the different fabrics and thicknesses under my feet. The leather suede under the ball has good grip, but felt sticky when turning. It also runs large. I usually wear a 10M in Bloch shoes (8.5-9 street shoe), but the 10M had over a thumb's width of extra length in the toe. Maybe if you have really high arches and want to show them off, this shoe would be good for you. I did not like it. I was skeptical because I read the reviews about fit and sizing, but I needed a new pair (after 10 years my old ones have had it). I ordered my street shoe size and they fit like a glove. The leather is SUPER soft and the suede sole is great for turning. They really flatter my foot and are extremely comfortable. My students are all purchasing these after trying mine on. I ordered a whole size higher and they still run small. Stinks that they run smaller. This is a beautiful shoe, that does great things for the leg line. When our company switched over last year, we could not because my daughter's extremely high arch meant the higher yoke line on this shoe cut into her skin and left a mark. After seeing how pretty they looked on all the girls last year, she decided to try again. After 5 weeks of moderate, not heavy, use, the heel is almost worn down to nothing and they are very stained from marley burns, which I find odd. I guess they are very soft leather and pick up abrasions easily. But the worst is that they STINK! My dd has never had a problem with her dance shoes stinking before, even pointe shoes, but these we can smell when she gets in the car after class. (Think soccer shin guards!!) So I am washing them on gentle now in a desperate attempt to cure them of their odor. I know it's not advised, but I'm desperate to get them cleaned and hand washing the soccer guards never worked, so I'm doing the machine this time. If it ruins them we may have to buy a new pair and hope that baby powder works going forward. I think these shoes have more neoprene in them that absorbs the sweat, which then causes the odor. We may switch back to the more leather neoflex that doesn't hold the sweat in if my washing is not successful. Most of this shoe is stretchy satin. Only the top is leather. The "pleats" on the sides of the shoe aren't actually pleats, they are an embossed design on the leather, which is probably better than pleats. The leather pad on the ball of the foot is great for certain floors. The heel is plastic and very low profile. Unlike most of Bloch's jazz shoes, this one has no leatherboard on the inside, so there is no resistance when you point your foot. It feels like dancing in thick socks. I usually wear at 7 1/2 in street shoes, but normally wear a 7 in Bloch jazz shoes (super jazz, lace up oxford, etc. ), but for this one I ordered an 8 because the sizing instructions said to order a half size up. I think a 7 1/2 might have been better because the 8 is a little large, which is surprising because I have broad toes. I ordered these for my daughter to replace the So Danca shoes that she has been wearing for years. They are super comfortable and her feet look incredible when she dances. She says they make her feet look pointed even when she is slacking! These are her new favorite shoes! She wears a size 8.5 street shoe and a size 9 in this shoe. The shoe runs small, definately order least a half size up from street shoe. I love the look, stylish and sleek, makes the arch look fabulous. The material however under the bottom of the shoe is very thin and tears easily. As soon as I put the shoe on my foot, the material tore under the bottom. poorly made, I would not purchase this shoe, I am returning this shoe to purchase the Bloch Flow jazz shoe. My daughter loves these shoes. However, they run fairly true to street shoe size. She is generally a size 8 to 8 1/2 shoe or boot, and we ordered these in a 8.5 and definitely too short (she has a narrow foot). Have exchanged for either the 9 or 9.5, but shoe seems extremely comfortable and well made. I'm size 37 1/2, but 38 fits me better in street shoes and boots, what's my size for this one?